Dr. Louis Schipper is a Professor in the School of Science at the University of Waikato. He received his undergraduate, Master’s, and PhD degrees in biology from the University of Waikato. Afterward, he accepted a postdoctoral position at the University of Florida before returning to New Zealand to work as a scientist for Landcare Research. Louis joined the faculty at the University of Waikato in 2005. Louis is a Fellow of the Soil Science Society of America as well as a Fellow of the New Zealand Soil Science Society, and is an author on two patents. Louis is here with us today to tell us all about his journey through life and science. Louis likes to spend his free time with his family. He and his wife are involved in Cub Scouts with their two kids, and they enjoy getting outdoors, hiking, and camping with the group. Louis also works outside restoring native vegetation and gardening at home. Research in Louis’s group focuses on how we can work with the land to achieve the food and other things we need while minimizing negative environmental impacts. To do this he looks at microorganisms in the soil and the cycling of nutrients in soil. “When you are a Bear of Very Little Brain, and you Think of Things, you find sometimes that a Thing which seemed very Thingish inside you is quite different when it gets out into the open and has other people looking at it.” by A. A. Milne. Louis is the first person from his family to go to university but both of his parents were fascinated by science and interested in how the world works. He chose to study biology because he was drawn to the structure and organization that he found in fields like microbiology. Excited by great success with a small-scale denitrification wall that effectively used microbes in a woodchip and soil medium to reduce the nitrogen in groundwater, Louis was eager to see whether this solution would scale up to a larger denitrification wall. He set off to work on a 120 m long trench filled with soil and sawdust. After much hard work setting it up, they discovered that it wasn’t working as it was supposed to. It took nearly two years for the team to determine why the wall failed, but they were able to identify the causes. This idea of building de-nitrification walls with woodchips and soil microbes is in itself a big success. It was a struggle for he and his colleagues to get their ideas taken seriously, but now they are seeing farmers installing the systems and other researchers are digging in to optimizing the function and determining the most appropriate uses for these systems. When Louis was doing a postdoc in Florida, he was conducting field work in the wetlands in Florida and Georgia in the Okefenokee Swamp and the Everglades. These wetlands were staggeringly beautiful and there was wildlife everywhere. He recalls one incident in the Everglades where he and a colleague were stuck on a metal boat in the flat swamp as thunderstorms rolled in. They kept calm and sought refuge in the water for a while (likely surrounded by alligators and snakes) before getting back in the boat and riding out to safety. This was definitely a memorable experience. In Louis’s lab, there is a tradition that lab members have to bake a cake for the group whenever they submit a paper, write a thesis, or have a similar large accomplishment. 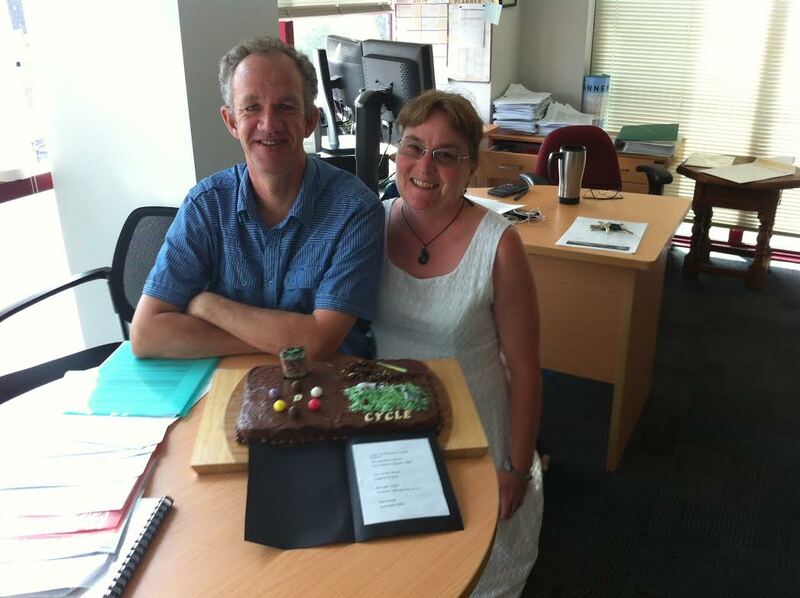 The cake has to be an abstract for the work that was submitted. There have been some fantastic cakes over the years, including one student who baked their first cake ever to celebrate his thesis defense. Don’t become attached to the results of any particular experiment that you do. Also, make it a priority to educate young kids because they are capable of learning science and it is important that they do. Louis has been interested in understanding how the world worked since he was a young child. Originally trained as a microbial ecologist, he has become particularly keen on determining agricultural management practices that decrease unwanted environmental impacts of productive land use. He has helped develop denitrification beds which are large lined holes in the ground filled with woodchips through which water containing nitrate is passed. The nitrate leaks from agricultural fields and these wood chips provide energy to microbes that turn nitrate to harmless nitrogen gas reducing pollutant inputs to streams. Together with colleague, Dave Campbell, he also leads a team of researchers trying to find agricultural practices that remove carbon dioxide out of the atmosphere and store this carbon long term in the soil. Their team and their research can be found at www.waiber.com. When they publish a paper, the standing rule is to make a cake decorated to summarizes the research: http://waiber.com/research-cake. Outside of science Louis and his wife, Angela, have been cub scout leaders starting some 10 years ago when their children began as cubs. Angela is the organizer and Louis makes sure she has enough coffee, food, and shelter to keep the 30 or so cubs excited and learning. The family enjoys long day walks together. Angela has also been involved in developing science resources for schools http://sciencelearn.org.nz/Contexts/Soil-Farming-and-Science, something they have both been passionate about since their days at University.